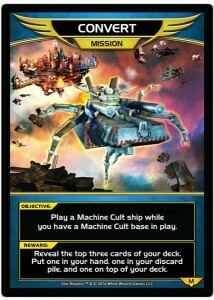 Objective: Play a Machine Cult ship while you have a Machine Cult base in play. Reward: Reveal the top three cards of your deck. Put one in your hand, one in you discard pile, and one on top of your deck.